Vilma Santos's Urban Legends, Part 1: "The Mysterious Hanky"
One of the trademarks of the Star for All Seasons Vilma Santos is her handy hanky that always goes with whatever she's wearing. One story says she got the habit from friend Coney Reyes (upper left inset, wearing a jacket). But what is the real story behind the now Batangas Governor's hanky habit? When did she start carrying what mischievous rumormongers call Vilma's "mysterious hanky"? In 1963, a nine-year-old girl from Trozo, Manila, went toSampaguita Studios for a movie assignment that her cameraman uncle got her. Shewas supposed to star in a movie with then big-name actresses Gloria Romero andRita Gomez. But along the way to the set, she and her mother stopped by anongoing audition for kid actresses for a new movie. Star-maker and SampaguitaStudios owner Dr. Jose "Doc" Perez saw her and asked her to join the audition.Hesitant at first because she had already committed herself to another movie,she later gave in to Doc Perez's request. He was the movie company's owner,after all. When her turn to act with veteran character actress BellaFlores came, everyone was impressed, including Doc Perez himself. She did notonly pass the audition, she also got the lead role. The movie was titled TrudisLiit (the first of her 196 movies), and the little girl who got the leadrole and later got an acting award (the first of her 75 awards) for herperformance was Vilma Santos. 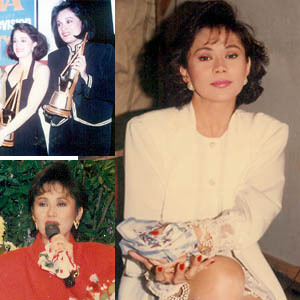 Fittingly dubbed as "The Star for All Seasons," she hasmaintained her luster despite the years and changes in show business; despitethe challenges brought about by the coming of younger stars; despite theintrigues, challenges and personal problems that threatened to rid her of herthrone as a queen in Philippine movies. Vilma Santos maintained her status as a bankable movie starand as a critically-acclaimed actress over the four decades (and stillcounting) that she has been in show business. Vilma won not only numerous topacting awards, but also the love and loyalty of movie fans who call themselves"Vilmanians." This five-foot-flat Scorpio-born also gave a new meaning tothe term "versatility." Adding to her roster of abilities and talents—acting,singing, dancing, producing and hosting—she entered politics and governedfirst, Lipa City, and eventually the whole province of Batangas, famous for its machismo or "pagigingbarako." Victorious Vi transformed from an award-winning box-officeactress to a well-loved, highly respected public servant—Batangas GovernorVilma Santos-Recto. URBAN LEGEND: THE "MYSTERIOUS HANKY." But a legendarystar like her is not without naughty rumors, tall tales, or urban legends.Vilma had her share of stories bordering on exaggeration and fallacy. One such story is the urban legend of Vilma Santos's"mysterious hanky." One tale has it that she always carries a hanky to hide thebulging veins on her left hand. Mischievous rumormongers have another versionthat says Vilma has very sweaty hands, that's why she always has this handyhanky—to wipe her hands first before shaking a person's hand or touchinganother person. THE HANKY EXPLAINED. PEP (Philippine EntertainmentPortal) sought the help of no other than Jojo Lim, the president of VilmaSantos Solid International, Inc. (VSSI, Inc.), to shed light on this urbanlegend. Jojo Lim a Vilmanian since 1978, gave PEP what he knowsabout the "mysterious hanky" of Ate Vi. "Ang alam ko, simula pa ‘yan nung bata pa siya. Si Papa[Amado] Santos, lagi siyang pinagbabaon ng lampin para pamunas ng pawis niya,"Jojo narrated. Jojo continued that Vilma later gave up the "lampin" forsoft, signature hankies that matched the color of her clothes in the ‘80s. Clothes thatwere made by popular designers Danilo Franco, Chiqui Hollman, Steve de Leon,Danny Acuna and Rajo Laurel. "Since trademark na noon ni Vi yung panyo, kaya yung mga designers niya, kapag iginagawa siya ng damit, lagi nang may katerno yung panyo," Jojo added. VSSI auditor Al Valencia, a Vilmanian who fell in love with theStar for All Seasons the moment he first watched her in Lipad Darna Lipad,gave PEP another story about the hanky. "Nung ‘80s, barkada kasi ni Vi si Coney Reyes. Siya yungnag-suggest kay Vi na lagi na lang magdala ng panyo sa kamay," began the Vilmanian"Trivia Guy." "Si Vi kasi noon, kapag pinupunasan niya ang pawis niya, tissueang ginagamit. Nag-iiwan tuloy ng himulmol o piraso ng tissue sa mukha niya.So, sinabihan nga siya ni Coney na panyo na lang. So, from then on, lagi nangmay dalang panyo si Vilma." But the most legit explanation to the "hanky mystery" comesdirectly from Governor Vilma Santos-Recto herself, when PEP caught up with herin a presscon sponsored by Bear Brand, the milk brand she endorses. PEP asked her for the story behind her now trademarkhanky-on-hand. "Protection," the legendary star answered simply. "Protection ko sa pawis, sa alikabok, sa dumi." Gov. Vi said she started to always carry a hanky on her lefthand during her Vilma! (Vilma on Seven or V.O.S.) days.She now needs to carry it more often than before, now that she's always on themove, visiting barangays in Batangas in the sun's heat and the blowing dust to see what theBatangueños need and what she can do to meet their needs. Next week, PEP will tell the real story behind another VilmaSantos urban legend.